Small banks are at a crossroads: adopt new technologies or face the possibility of shutting the doors. For community banks in highly competitive markets, service with a personal touch can be a differentiator to win and keep customers. But when legacy technology hampers the customer experience, all the cups of coffee in the world won’t help. The story at Americanbanker.com describes how board members of R Bank in Round Rock, Texas — one of whom is Hall of Fame pitcher Nolan Ryan — committed to an investment in a systems overhaul at the $455 million-asset bank. It’s no secret that small and mid-sized financial institutions have been somewhat slow to climb the innovation mountain. 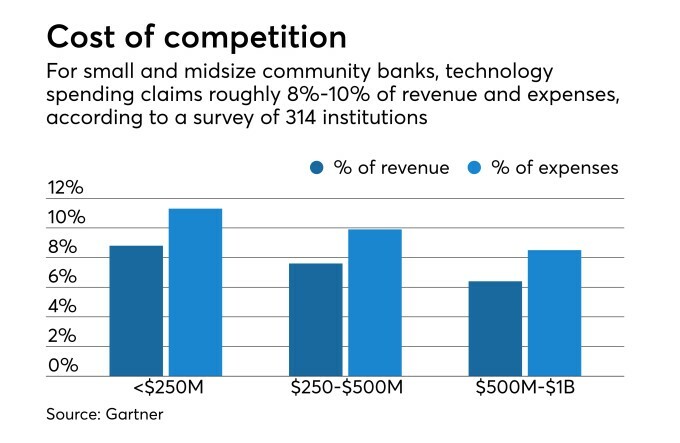 But how much are small to midsize banks investing in their technologies? The chart below shows a very interesting comparison — for banks under $250M, the ratios are very high. The article goes on to note that overall bank technology spending will increase 4% this year, but 65% of spending will still go toward maintaining existing systems rather than new technology. The bank purchased a new a core account-processing platform from Fiserv after six months of vetting vendors. The new system is scheduled to go live by the end of July. According to Stapp, it will eliminate many manual processes and provide employees all of a customer’s banking relationships in a single digital view. The new tech will allow employees to work more efficiently, which Stapp said is key for drawing younger customers. The truth is, while core system replacements can be daunting — financially and organizationally — it’s the kind of bold action that will keep smaller banks in the game as they are able to serve the preferences of younger markets. Even in the small bank market, there is a move toward modernization of platforms. Automation technologies like OrboAnywhere support this in the area of check processing by driving efficiencies to new levels across the omnichannel of the financial institution. That enterprise-wide impact can be an eye-opener for not only operations, but for the board of directors.